If you are a Google Chrome User then you might get DNS_PROBE_FINISHED_NXDOMAIN Error any time. In Most Cases Users are facing this error in Chrome Browser only, Whilst you can easily access any web page on Mozilla firefox or IE. This error Occurs because DNS lookup Fails When you try and access the Webpage. It is also Important to Keep your Windows PC Clean and Optimized, As said times and times again. So I Recommend you to Keep your PC Clean and healthy which will keep all these network and system errors away. We Recently Posted how to Fix Critical Process Died Blue Screen of Death Error in Windows 10. Ok then, Today i will Share Few Methods that can help you to get rid of this Error Code Dns_Probe_Finished_NxDomain easily. Follow the Below Mentioned Steps and you will be good to go. As This Issue Occurs because of DNS, We will first try to Flush the DNS and see if this helps. Step 3: You will see Command prompt is now open, Now Simply Type the Below Highlighted Command as it is and press enter. Step 4: Once the Above Command is Executed, You will be able to see "Windows IP configuration successfully flushed the DNS Resolver Cache." on the screen. Now Reboot your PC if you want or try to open the same web page what was showing you the DNS_PROBE_FINISHED_NXDOMAIN error. Your Browser issue now be fixed by now, If not then move on to method no. 2 shown below. In this method You will need to do some tweaking in DNS Settings which i will show you in just a bit. First let me tell you that this requires you to Make some Changes in your DNS but these changes seems to work and helps to get rid of error this webpage is not available DNS_PROBE_FINISHED_NXDOMAIN. Step 1: Right Click on the Network Icon in your Taskbar, then Click on Open Network and Sharing Center. Step 2: A Window will open up, On the left Pane, Click on Change Adapter Settings. Step 3: Now you will see all the Network Connection but you will have to identify which is active and connected, It can be LAN or Wireless Connection. You will have to Right Click on the Active Connection and Click on Properties. Step 4: Now another Window will Pop up there just Click on Internet Protocol Version 4 (TCP/IPv4) and then Click on Properties button under it. Now Click OK and try if you still get the Dns_Probe_Finished_Nxdomain error in Chrome. 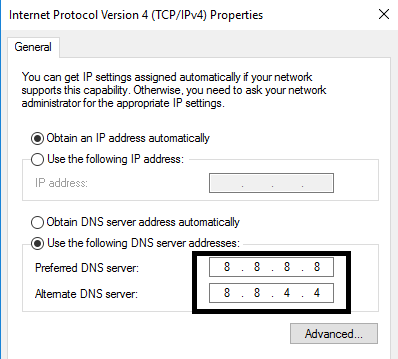 Note: You can Uncheck Internet Protocol Version 6 (TCP/IPv6) in Step 4. This method only works in Google Chrome. So, Resetting the feature method is for Chrome users only. If both the above method has failed to fix your issue, then below mentioned steps should fix it. Type "chrome://flags/" in address bar and hit Enter. Now Click on "Reset all to Default" button from Right hand side. Close Chrome and Open it again. Try to open the Webpage now. > Issue Solved? This is how to Avoid it next time. So now that your Dns probe Finished nxdomain error is solved, the only thing you might want to do is make sure you don't get it again. So Download Total System Care which will keep your PC Clean and error free at the same time. These Two Methods Works to Fix Error DNS_PROBE_FINISHED_NXDOMAIN but if you still can't get rid of it then you can try to Reinstall Google Chrome on your Computer. Awesome !!! Fahad, Glad to know that this helped you. Have a Great day !!! Hi Arun, Amazing to know that this post fixed your issue. The server at wordpress can't be found, because the DNS lookup failed. DNS is the network service that translates a website's name to its Internet address. This error is most often caused by having no connection to the Internet or a misconfigured network. It can also be caused by an unresponsive DNS server or a firewall preventing Torch from accessing the network. it says that u need atleast one IP address to change the settings now what to do ????? Hi Mihir, Can you please let us know more about your issue? Make sure you perform all the above steps properly first. Hi Chiew kok chen and Jayesh Ellayah, Its amazing to know that this solved the problem for both of you. Tried Method 1 but got 'The following operation requires elevation (Run as administrator) Tried Method 2 and it didn't work. Recommendations? Hi drlislewis, Make sure you Run Command Prompt as administrator. This should help you !!! Tried with both method but still not working on my PC. now please tell me what i can? IT WORKED !!!! Thank you so much !!!! drlislewis, to open command prompt as administrator, you need to click Windows + X, Then click on Command Prompt (Admin). I hope this clears things up.. I was having this same problem and I went to the command prompt and did ipconfig /flushdns and that fixed the problem I was having. good luck! Hi Erik, Glad to know that worked for you.. Thanks for taking your time and letting us know about it. Problem solved by using method . Thanks a lot! hi shan234, are you sure you are entering correct values? please try again with correct values as shown in the picture. Second method worked for me. Hey thanks for your Comment and i am glad this helped you. thanku so much its work..
Hi Paul, I certainly Started Using Microsoft EDGE after Windows 10 Update. It is fast and Smooth. Excellent! The second method did work for me. BIG THANK YOU! You are Welcome David !!! Still not working . Showing the same message Dns_probe_finished_nxdomain. I tried each step, and none has worked for me. Any other suggestions? Done both methods, still same error. tried delete and reinstall Chrome (install only works with chromestandalonesetup.exe). still chrome gets no site, tho Edge does. tried with firewall off, no change. You are Welcome CYBCYB. have a good day. why I cant click " properties button " in second method ? Thanks Mate, 2nd method works. When I do method 2 and right click on WiFi then properties and go to IPv4 to click properties it's grey and I can't click on it Idk what to do I've tried everything I could think of. Can you help? I cant find my network icon as dumb as it seems... Where should i look? hi EVELINA, Go this, Open Command Prompt > Network and Internet > Network and Sharing Center > Change adapter settings. There you will see all the networks. Hope this helps. Is there a way to fix this without being the administrator? ie. your administrator oversees a very large company and is near impossible to get hold of. hi victoria, changing DNS settings in method 2 probably don't need you to be admin. so try it and see if that helps. How do I use the command prompt as a administrator? I did try both methods, but still none of the browsers installed on my computer work. I usually use chrome, but also tried Explorer and Firefox. The error message they give days the server can't be found. Could it be a hardware issue? All other devices in our home connect to the Internet just fine. Hi Homini, It can not be hardware issue. If you performed all the steps perfectly and still getting the error then please Run CCleaner on your PC and don't forget to check DNS Cache Box from the left pane. Ive triied everything andstill no luck. I cant get on the internet so i cant download Ccleaner. Ive literly triied everything mentioned here and more with no luck. Any suggestions? Non of the methods worked, infact i cant even re-install chrome because all of my internet explorers dont work! Internet explorer says this "make sure the web address http://www.google.com is correct. Look for the page with your search engine. Refresh the page in a few minutes. Thank you so much for this!! This happened to me today but following your instructions fixed it. So thanks again! None of the methods worked for me. (Strangely, I could VPN into my work network without problems and could access the internet via my work's proxy server. This worked via wi-fi only, without the ethernet cable plugged in.) I tried the methods here and others I found on the internet, but no luck. What did work for me: 1) I deleted - as opposed to disabling or uninstalling - the network controller driver. 2) I reinstalled the driver from Windows Update. I spoke (wrote) a little too soon. I had to do the same steps above with my wireless adapter. Somehow the drivers of both the ethernet and wireless adapters got corrupted at the same time. Luckily I had the VPN setup that wasn't corrupted. That allowed me the internet access I needed to download and install the necessary drivers. I'm guessing that most would not be as lucky. Method 2 worked for me, thanks. After doing that, here is another error "Your access has been blocked by firewall policy 120. " please help. The internet has recently stopped working on my laptop. I have tried Googling solutions and tried many different ways to try and fix the internet but it still doesn't work. It doesn't work on any browser, and all websites don't work. However, the internet still works on other devices connected to the same network. I tried Method 2 of Changing DNS settings, but when it came to Steps 4 and 5, I became stuck. I clicked on "Internet Protocol Version 4 (TCP/IPv4)" but it did not allow me to click on "Properties" or "Uninstall", only "Install". I believe this is a problem to do with my network settings since it is not a website nor browser problem, and other devices can access the internet using the same network. This was caused when I tried downloading a game torrent, but multiple viruses and additional programs were installed along with the game. I have since uninstalled all programs using "appwiz.cpl", and cleaned the laptop with AdwCleaner, but still cannot fix this problem. I am hoping you have a solution to this problem. I am happy to discuss further and provide you with details of my laptop settings if needed. Hi Michael, Please make sure you have a Active Connection. Thanks so much.Method 2 worked perfectly. Bless you. Thanks again! 4). check "use this connection's DNS suffix in DNS registration"
5). done. close and restart your browser. İ dont know how much my case is related to the topic. Here it is. I got a samsung note 5. I recently have updated it to the latest marshmellow 6.0.1 android. Everything is safe and sound now. However the problem is that since i live in iran i have to use kinds of proxy servers or vpn's in order to access my social network accounts, you know, facebook and stuff. As long as i had not updated my phone i could easily get connected through any sort of proxy applications and vpns. But from the moment i flashed the update in i started to lose access to them. My facebook app cannot refresh and whenever i try to get connected through the chrome and the like i see the dns error. Id be grateful if you could help. i've done all that and now i'm re-installing chrome but it can't be,help me.. I had this problem and switched my laptop off and on again. I'm not fibbing, the problem went away and I don't know why. See all the plugins and antivirus are upadated. after seeing this error appearing and getting more frequent on my Surface Pro 4.. I finally worked out what was going on. It turns out that I had ethernet interface (on the dock) connected but actually connected to the internet over WIFI. It seems you get this error when you have both interfaces active but only one is connected to the internet. Solution was to disconnect/disable the ethernet interface while internet is via wifi. Hello Robert, You can try Clearing Cache. I Am having DNS_PROBE_FINISHED_NO_INTERNET problem in my PC. Hello! :) I am running windows xp sp3 and been having this DNs for a few days now. did all the winsock reset, ipconfig, dns change, reinstalled chorme, opera, mozilla, reset and reinstalled the drivers and i am still getting the DNS thingy error from time to time. i know i sohuld change windows etc, but for now this is not an options. maybe you have any other tips what i could try? Oh thank god! Finally I found a solution that works! Thank you so much! This is happening on my Sony z5? dns_probe_finished_nxdomain Very easy solution is here.